This Roamer Standard came in a batch of watches out of the UK. It had a lazy amplitude and it didn’t keep time. Also, the set lever spring was broken. Here we go. The movement is a MST 352, hand winder with 17 jewels. It has a 3-finger bridge and no shock protection. I’d date this Roamer Standard to the 1940s. I remove any power from the mainspring. Then, I take out the balance and the pallets. This is to prevent the escapement from damage while working on the train wheel. I removed the ratchet wheel, the crown wheel with its shim and then the barrel bridge. There is a lot of filthy grime under the ratchet wheel, the crown wheel, and around the click. I removed the train wheel bridge so the train wheel is exposed. Finally, I lift all the wheels and the main barrel is the final part I take out on that side of the base plate. After this, I flip the movement and completely clear the dial side of the base plate. I put all the parts in the watch cleaning machine for 6 minutes in each bath. I start with the main barrel and the train wheel. Then, I fit the train wheel bridge again. I continue with the barrel bridge, crown wheel, and ratchet wheel. Next, I flip the movement and start assembling the keyless works and the motion works. 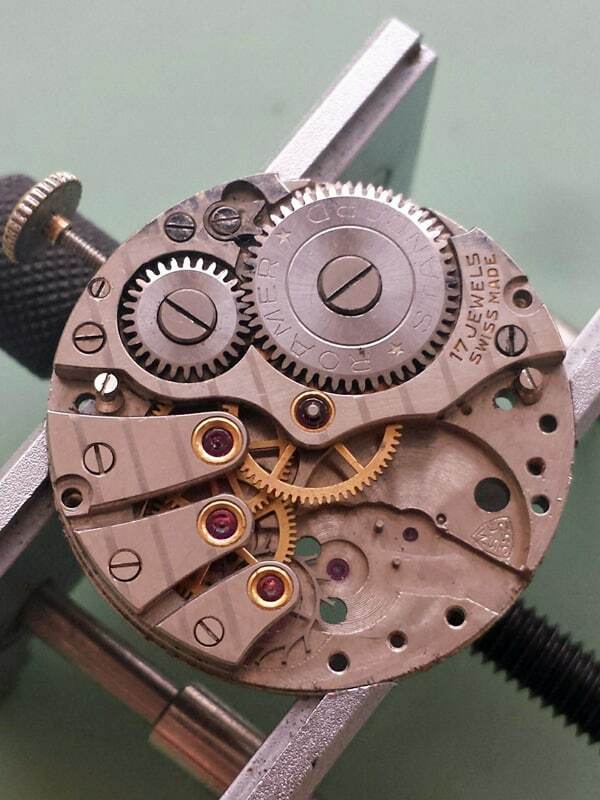 I install the brand new set lever spring so that switching between winding and setting the time is snappy again. Then, I flip the movement again to install the pallets and finally the balance. I fit the hour wheel back and then I reinstall the dial. After that, It’s only a matter of fitting back the hands and re-case it. The movement is like new again and this Roamer Standard certainly looks good for more than 70 years old.